We found Magic Martin and his team professional, polite and respectful.Martins pre- planning of my move was exemplary and this ensured safe handling of all my belongings.Working like Trojans from 8am until 7 pm on one of the hottest days of the year, they were always willing to go that extra mile with focus and cheerful positivity. Martin provided an excellent service which quickly removed my anxiety of downsizing. 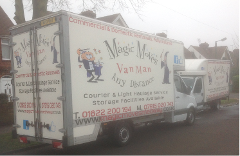 I would recommend Magic Moves without reservation and have used their highly reliable services since my original move. 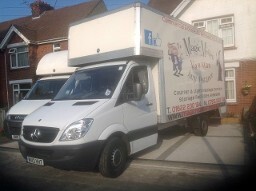 ACE SERVICE- I have now used Magic Moves on a number of removals, they never fail to deliver. Martin and his team are professional, courteous and work hard to get the job done well. I would certainly recommend them to anyone. Martin and his hardworking team certainly took away all of the stress from our big move. Thanks again for your help. Being a student I found Magic Moves prices to be really helpful, quick job, carried out well. Picked up my belongings, handled them with care, took them where they needed to be and unloaded. A very happy customer.